Invigorate your outdoor space with the Navio 3M Scotchgard Outdoor Panel. 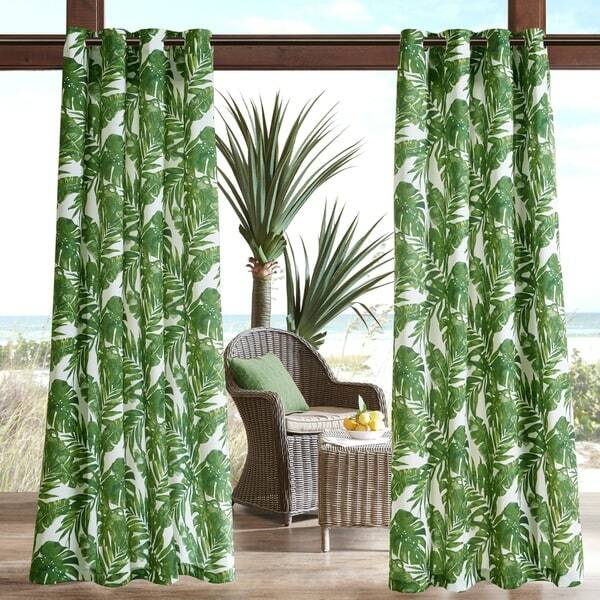 Lush palm leaves will give your decor some tropical flair, while the durable fabric provides long-lasting protection. The 3M Scotchgard treatment helps repel moisture, resist staining, and creates a water barrier that keeps these curtains drier longer. Simply hang to stylishly separate your space, enhance privacy, or filter the right amount of light for comfort. Washing before use will soften the fabric. The quality of these curtains is top notch, but the color is not the gorgeous vibrant green shown. It is more of an Olive tone. This, unfortunately, clashes with the room where I had intended to hang them. :( see my photo for a screenshot of the stock image and an actual picture of the color. I am trying to figure out if I can use them elsewhere because they really are lovely, just the wrong color. 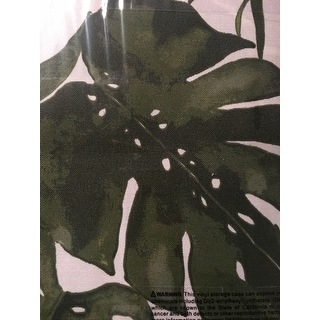 The pattern of the palm leaves and the color is very realistic and looks natural. These curtains will go well with either traditional tropical decor or even a more contemporary take on a tropical theme. These curtains are excellent quality. The fabric is thick and substantial. The colors are vibrant. We used these curtains in a jungle theme bedroom and they really pull everything together. Keep in mind these are not black-out curtains, although black out material is inexpensive and could be applied to the back. These curtains are absolutely gorgeous. I was timid to order with so much green. The pics don't do them justice. Very nice in person. Not lined, you can see the print on both sides, one side being a bit darker than the back side. Overall a great choice for outdoor curtains, sunroom, porch, etc. We love the curtains we purchased for our dining room, very durable and sturdy. My only con for these curtains is that the green in the picture is not true to what you get. The green of the curtains is more of a olive and hunter green instead of a kelly. Though they still look great with the navy paint we just put up. These are beautiful! They are definitely more of an olive green and not the vibrant green in the picture but I still love them. They do let some light in so if you were using them for room they would need a darkening liner. These were nicer than we had hoped. They aren’t light difusing but they’ve helped keep our living room cooler. We’re very happy with the way they complete the look of our home!! They were exactly as pictured and I love the fabric. Very happy with them. However, since our glass sliding doors are so big, I am going to order two extra panels. They make the room look so bright and summery. Never again will I buy anything from Overstock. AMAZON knows how to treat you. I absolutely love these curtains. I have them in my family room and I have them in my foyer. They’ve got great weight and all the creases came out after a few days of hanging. Quality, lovely (blue) color that goes with our newly decorated office perfectly. No need to iron! Happy with these panels. Love these. Great vibrant pattern, but a little pricey for one panel. Absolutely gorgeous! Very well made! "Are the Palm trees on both sides of the curtains - back and front"
"Is this one panel or two?" This is one panel only. I have a wooden floor/tile with white window shutter. The leaves and the color makes the room very relaxing & calming! "What size are the grommets?" The inner grommet diameter is 1.5”, so 1.25” rod is recommended. No it is not lined, but it is treated for water repellent.